Up next on the list is our local favourite, the Snowbird RV Show at Tradex Centre, Abbotsford..
Join us in booth #34 as we display our PRXB Exhaust Brake, LoadLeash Engine Brake and AMP Air Springs. We are extremely excited to announce our FALL PROMO for this year! 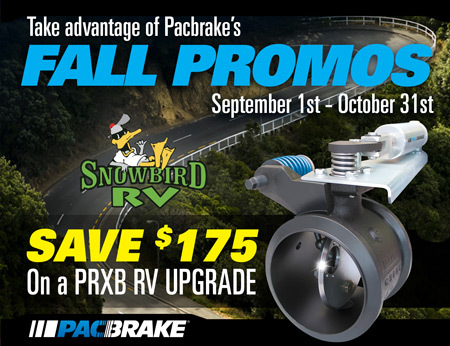 You can now SAVE $175 on a purchase of a PRXB RV Upgrade Brake. Click to view our RV Upgrade Application guide. What are you waiting for? Swap out your old fixed orifice brake for a longer lasting PRXB exhaust brake to get a better built and a significantly better performance!